Many old or classic photographic processes operates from a negative or a positive at life size of the final print. These intermediate negatives or positives can be traditionally elaborated on photographic film or, taking advantage of the digital image technology, inkjet printed on some suited transparent or translucent media. This later system need a previous digitization of the original film, both negative or positive. Afterwards, this digital file can be processed by classic digital image processing software. This processing can in turn be performed for aesthetic purposes or as a calibration step. Although the digital imaging technologies had been used from approximately 1963 at NASA Jet Propulsion Laboratory, digital image processing for pictorial photography was only available at late eighties through drum scanners coming from pre-press industry. Already at this early time, several photographers have understood the valuable and extensive field of action being opened by this new technology (2, 3-BURK.). At this time, perhaps the main constrain was the expensive equipment, scanners and computers, necessary to approximate the quality of photochemical fine printing. At the beginning of the 21th Century, digital cameras come into play with higher spatial resolutions and computers have achieved enough power of data managing. All that along with affordable prices for professional work applications. 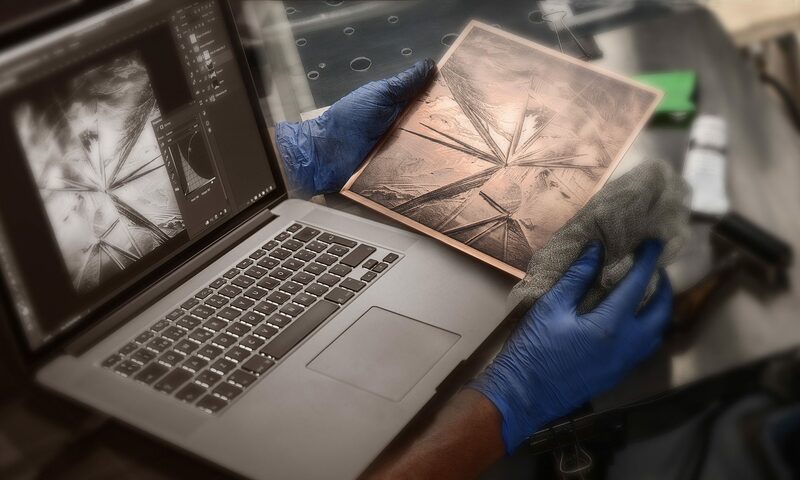 Professional photography embraced the digital imaging as almost the only option for the majority of applications, while some amateurs and almost all the practitioners of alternative processes remained attached to the traditional systems. This attachment was also a conscious choice in most cases and the claim to the purity of traditional processes remain today in some circles. As respectable as any other option, they are only a part of the whole body of work. As in many other fields of study, digital imaging as a step added to the old photographic processes must be framed for a given purpose. The aim of this and following texts is the use of old photographic processes as a final artwork. The proposal avoid any compulsory rule and any limitation in the use of technology. Even though the study, research and preservation of the original technology is interesting in terms of cultural and technological heritage, it should be always differentiated from the utility of a given system to show a picture in the best way as a piece of art. 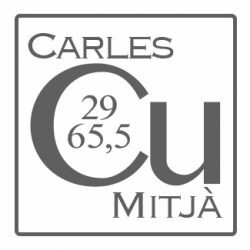 Within the same field of study, but restricted to the calibration of the method, there are several interesting recent contributions. In the opinion of the author, Precision Digital Negatives from Mark Nelson (6-NELSON) and Digital Negatives for Palladium and Other Alternative Processes from Ron Reeder (7-REEDER), are both of valuable interest for those interested on calibrating any alternative process using a hybrid technology. Free of any constrain not strictly related to obtaining the best print one is able to do, photochemical capture followed by digitization or direct digital capture and the subsequent digital image processing gives today a great advance in the generation of positives or negatives suited for traditional Silver prints, Carbon Transfer prints, Platinum and/or Palladium prints, Cianotype prints, Polymer Etching prints, Polymer Photogravure prints, Photogravure on Copperplate prints (Heliogravure) or any other contact printing method where it is necessary a life size negative or positive. The chosen printing method will depend on some preferences as tone, image volume or the print life expectancy, between others. These particular properties can also be considered in intimate relationship with the image content and the expressive possibilities derived from the use of a given paper, image tone, ink, etc. in the final artwork. Finally, a sometimes necessarily slow and laboured process can also help the author to better express his or her potential creativity. Following the tradition of the “well done things”, the preparation of a digital file suited to be printed as a negative or as a positive on transparent medium is often as long and cumbersome as can be to perform a well finished traditional print. Perhaps the only one difference is that the digital method allows the user to go back and force again and again with no other penalty than the time spend facing the computer screen. Additionally and beyond the opinions based on personal preferences, a couple of advantages are out of discussion. The dynamic range available by some current digital camera sensors is higher than the available by any past or nowadays existing photographic film. In second place and not less important, the level of intervention available by digital image processing, specially in very reduced areas of the image, goes far beyond any virtuous darkroom craftsmanship. Someone can argue that those limitations of the photochemical methods are indeed a part of its soul and magic. This is correct as an opinion or personal preference, but it is not related with actual performance helping to achieve the higher level of success in the fineness of the final print. In the same manner that all darkroom rules and advices published by the masters of photochemical fine printing were dictated looking for the best possible print, it seems logic to follow the same path by the use of any kind of tools as they become available. Another question on the table is about the convenience or not of an “excessive” intervention on the tones of the print. There are several ways to answer this question. In first place, as the lens, films and sensors do not have the capability to collect and capture the actual photometry of the scene, there is no reason to preserve the original tone relationship, both in the negative or in the digital raw file. Even more, being our visual perception of scene tone and contrast not equal nor related with the lens, film or sensor reaction to the scene, here we find a second reason to do not be constrained for the negative or raw file content. This was very well understood by early photographers. We can here resort to the famous quote of Ansel Adams, “The negative is the equivalent of the composer’s score, and the print the performance.” (1-ADAMS), (Fig., 1). Replace here the negative by the raw file in the case of digital camera systems. Figure 1. 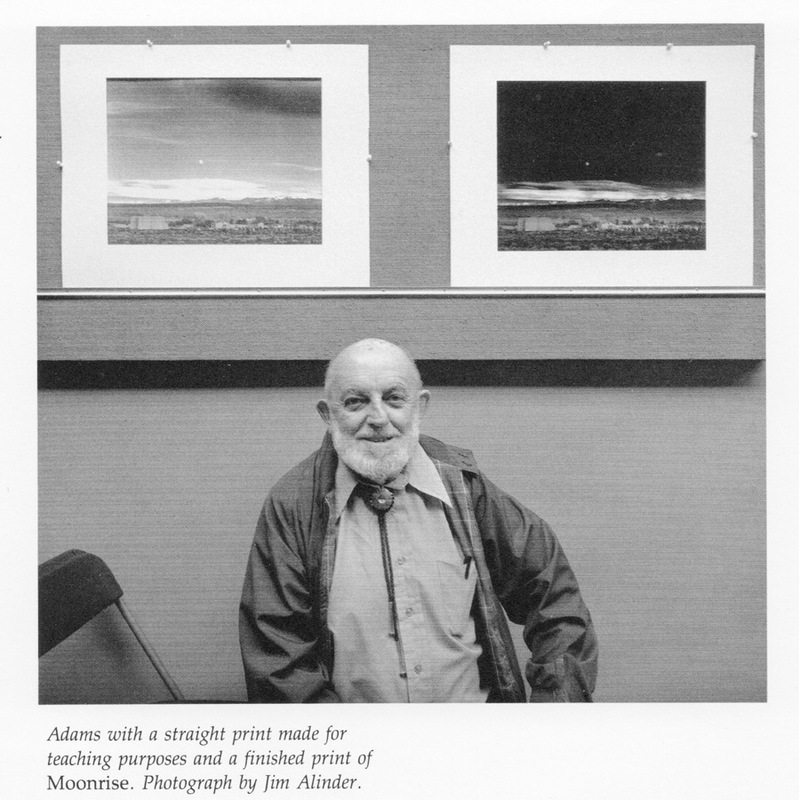 Ansel Adams under two prints coming from the same negative, his well known “Moonrise, Hernandez, New Mexico” from 1941. At left, an straight print of the negative content. At right, the final fine print locally manipulated to achieve the aspect Adams pursued from his visualization during the scene taking (2-ALINDER). The previous Ansel Adams quote find its sense in a second sentence of the same author, “A great photograph is a full expression of what one feels about what is being photographed in the deepest sense, and is, thereby, a true expression of what one feels about life in its entirety.” And even, “No man has the right to dictate what other men should perceive, create or produce, but all should be encouraged to reveal themselves, their perceptions and emotions, and to build confidence in the creative spirit.” Although Ansel Adams is not the solely author quoting about that, he was almost obligated to clarify the concept in order to avoid that his rigid and complex Zone System were considered a goal in itself, rather than a path to the expressive final print. In a deepest sensitive way, the quote of Paul Caponigro, talking about “reading” images with Minor White, “To photograph not for what the subject is, but for what else it is” (5 – Multiple Authors), clearly expresses the possibility of a big departure between the image and that we call reality. As a consequence of all that, this and following texts will try to explain some rules and advices intended to extract the best of our digital files. As a first step, there will be discussed some preventions in the use of the scanner and also about the digital camera settings and raw files processing. Then, once the master digital file is saved, will continue with the paths to be ran in order to prepare the digital image before to printing it on the suited media. Do not forget that all developed techniques are designed thinking about two main goals. In first place, all discussed steps are intended for monochromatic images. Because of that, not all techniques are directly applicable to colour imaging. Second, explanations are supposed with a previous aesthetic goal in the mind of the author. Then, any process should pursue this target. Not less important is to keep in mind that, specially with digital imaging, a given result can be achieved through several ways and the proposed in this text is only the best way the author has found with the limitation of the extend of his knowledge. Beyond that, it must be realized that the evolution and capabilities of digital image processing software is a non stop run. Therefore, any rule or advice intended for today, can be changed tomorrow by a new approach. Finally, one main objective of this texts is to contribute, even in a little amount, to the continuous growing of the Photography body of work. ADAMS, Ansel (1983). The Print. The New Ansel Adams Photography Series / Book 3. Ed. Little, Brown and Co., Boston. ALINDER, James et Alt. (1984). Ansel Adams, 1902-1984. Untitled Series Nº37. Ed. The Friends of Photography, Carmel CA. BURKHOLDER, Dan (1995) Making Digital Negatives for Contact Printing. Ed. Bladed Iris Press, San Antonio, TX. BURKHOLDER, Dan (1999) Making Digital Negatives for Contact Printing. Ed. Bladed Iris Press, Carrollton, TX. Multiple Authors (1984) Minor White, A Living Remembrance. Aperture Nº95 Summer. Aperture, NY. NELSON, Mark Precision Digital Negatives. On line <https://www.precisiondigitalnegatives.com> Last visit: July 2017.